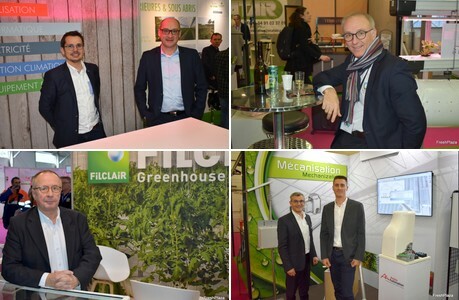 It's been three busy days for the exhibitors of the Sival exhibition in France. Starting Tuesday and closing on Thursday, the show attracted many visitors. "Better than ever", many visitors said. One thing is not to be doubted when visiting the Sival: it's a French show, and while the amount of international suppliers have risen over the years, speaking French is still key. While some exhibitors credited the exhibition as being 'the best horticultural show in Europe', narrowing it down to France might be good. However, the French market is very interesting and there's enough going on - so it's no wonder many exhibitors are choosing this show to participate in. Obviously many French companies participated, and walking around the show it sure is clear the French have created a horticultural supply industry that is technologically advanced, offers solutions to growers both within and outside the country's borders and is ready for further innovation and expansion. Check out the complete photo report here. The Netherlands was this year's guest country. Besides many Dutch suppliers exhibiting at the show, a delegation of purchasers was invited and many speakers were present during the exhibition’s conference programme. After the United States, the Netherlands is the second largest agricultural and agri-food exporter in the world.